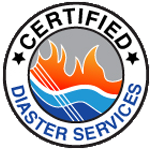 I give an A+ to Certified Disaster Services, for their quality and service in the finish work they installed in our home. Dave and David were so professional and fun! They spent 2 days installing crown and Shiplap and it looks phenomenal! (I wish I could attach pictures) The quality and workmanship are outstanding. I've already referred friends to Certified Disaster Services and would refer anyone else to them. I highly recommend them for any remodel/finish work.